namaḥ (n/V) – adoration, homage; prabhu – powerful, eternal, Tārā; dita – (1) bound, (2) torn, divided; āṭopa (m) – swelling, a multidude; mukuṭa (m/n) – tiara , diadem , crown; ākṣipta – thrown, tossed; mālinī – garland; hasat – laughing, smiling; prahasat – laughing, smiling; tuttāre – [a holy sound]; māra – Māra; loka (m) – world; vaśaṃkara – subjugating. You subjugate the world and māras. The tenth homage is to Jigten Sumgyal,Tib “Victorious Over Three Worlds”, who subjugates worldly beings. She is red and holds a victory banner. Multi-colored lights radiate from her crown, giving perfect joy and fulfilling the temporal and ultimate wishes according to the desires of beings. By saying the TUTTĀRE mantra melodiously with the eight attributes of laughter, (of the wrathful deity) she confuses and subjugates the demonic lords of the (sensory god realm), who are known as the “Controllers of Other’s Emanation”. She also subjugates kings, ministers, sorcerers, and wealthy householders and leads them to the path of liberation. In the root text, “the outer phenomena change only when self-appearances transform.” Therefore, subjugation is possible if the intention of the spiritual mother (non-dual emptiness-compassion) is attained, and there is no alternate method. The inner meaning is the four joys subjugate demons and afflictions. 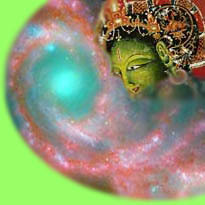 The subjugation of the three doors by blissful primordial wisdom is subjugation of the three worlds.